Spend a day on the farm! Meet local farmers, explore farm operations, watch demonstrations, learn more about farm products, enjoy recreational activities and ask questions about farm life at Open Farm Day 2015. You can plan on one hour of stay per stop. 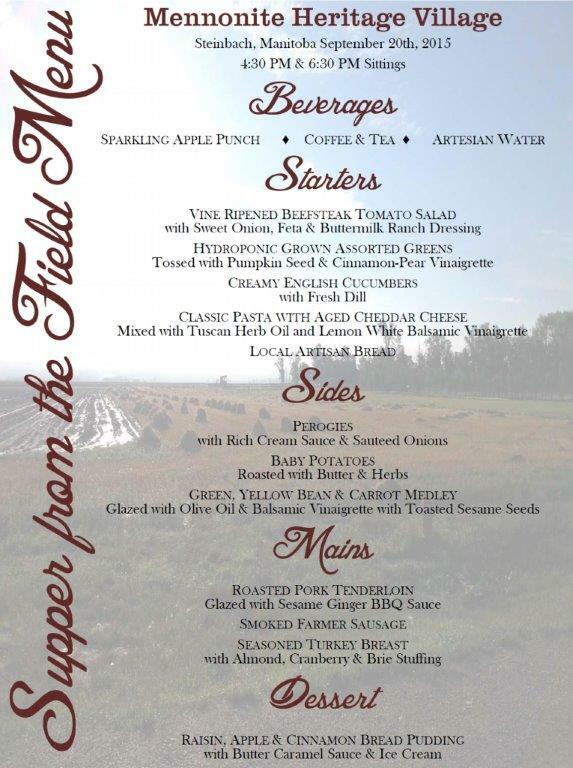 Also, enjoy a supper from the field at Mennonite Heritage Village in Steinbach. Sittings are at 4:30 pm and 6:30 pm. Buy tickets in advance to reserve your spot by Friday, September 4 by calling 204.326.9661 Ext. 228. Or, attend the 2nd Perennial South Osborne Harvest Dinner at 5pm. This dinner is an open air, pop-up feast, prepared by four of our city’s finest chefs and served outdoors in Winnipeg’s largest community orchard and garden commons. For more information email sustainablesouthosborne@gmail.com. Plan your route for Open Farm Day on the Interactive Map or print the complete guide. Feel free to visit as many farms as you like and consider staying overnight in the area to experience a full day and enjoy rural Manitoba. Contact us to reserve your site during your stay in Manitoba for Open Farm Day 2015.